The Last Presser: Bidding Adieu to another journey of a powerful purpose, values and love. Home Uncategorized The Last Presser: Bidding Adieu to another journey of a powerful purpose, values and love. In an undertaking where ability and the character counts, diversities accepted and promoted, and facts held precedence over comments, I learnt the best lessons of my college life, for life. Back in 2016, a day before Valentine’s Day, an array of the surprise addition to new WhatsApp groups and welcome messages from strangers marked my joining of the largest campus publication of India. Little did I know then that this small attempt to get an internship experience will end up being the love of my college life. This experience which constituted a major learning adventure in my college life will be treasured forever. Three years is a very ‘small time’ to have spent in the newspaper, which has built up a legacy of ten years, but having worked, grown and later led the paper as its associate editor in the final year, I can speak with certain intimacy of acquaintance about the values the paper has held for years. Facts, ethics, credibility and liberal values have always remained the guiding principles of the paper, the baton which I hope the upcoming batches will uphold with care. 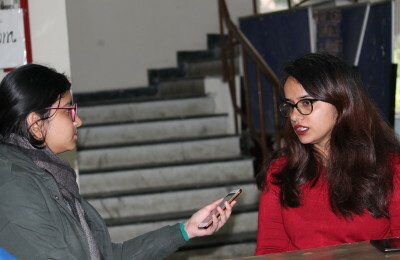 In these years the paper has largely widened its reach among the student community through various social media platforms, amidst this growing amalgamation of digital technology and journalism where the ethical lines are becoming thinner, the newspaper has been successful in upholding its values. Being caught amidst sudden riots during covering a protest, contemplating over societal norms during covering a street play competition, watching democracy function even in the small spaces of classrooms and colleges where students fought against issues like discriminatorily high fees for girls hostels, tireless coverage during the popular admissions session, organising the first on ground event marking the ten years anniversary of the paper are those small bits of larger professional experience that I was privileged enough to receive. Meeting Deans, university officials, student leaders and students, listening to their side of the story and yet adhering to non-partisan reporting is something I have learnt in the past three years. Teaching the same to the youngsters who joined the team during the past year will always be remembered as the best part of the time I spent here. Meeting the best people in the University because they were all on the same team has been the most rewarding so far. Meeting excellent academics who travelled abroad for their masters and offered their invaluable advice can be credited for the success of my study abroad plans. Seeing juniors from colleges joining the team and then falling in love with the paper, young writers taking up reporting assignments, colleagues turning into the best of friends and this heady journey of getting inspired to turning an inspiration have been exceptional. J P Scott, the longest-serving editor of the ‘The Guardian’ often believed the press as an institution that can take authority into account and can turn things around for a better society. And I believe that I have worked to the best of my ability to ensure the same during my time here. Wishing the very best for the future to the new kids.